Editor&apos;s Note: This is the first in a series of posts this summer following local couple JinAyla Sexton and her fiance Jason Bollman as they prepare for their wedding on June 23. The couple wanted to keep everything local and utilize the free resources we have available at the Hendricks County Convention and Visitors Bureau to plan their wedding. They are an example of how we can help future brides and grooms prepare for their big day. “What is this?” I asked dreamily. My boyfriend Jason simply said, “We’re here,” as if that explained it all. He was in a bow tie and I was in heels after a fancy Christmas-time date Downtown. He had suggested we drive around and look at lights, but the further out of town we went, the fewer decorations I could see. Still, it was late, and I was sleepy and content to enjoy the evening with this man I’d waited my whole life to meet. So, I didn’t ask too many questions when he stopped his truck next to an old covered bridge, got out and motioned for me to follow. “We can see the lights better from the bridge,” he said. The stars were all that brightened the woods as we walked, but after a moment the whole bridge suddenly lit up! I found out later he had spent that day stringing Christmas lights in the rafters, and that his family was waiting on the other side for the right moment to plug them in. 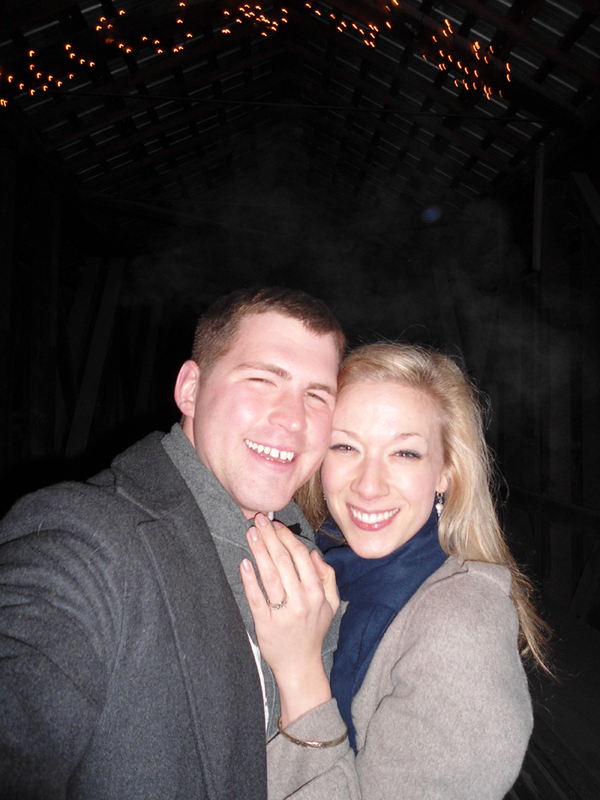 That magical night, Jason asked me to marry him, and I said yes. Jason and I both grew up in Hendricks County. We love the sense of community that we feel here. To us, this place is home, family and real life, which is what we want our guests to experience at our wedding. So naturally, Hendricks County is where I started looking for everything for our celebration. I began with my dress (of course!). On a whim one day, I stopped at Bare Necessities Bridal in Brownsburg, Ind., and there it was: the only dress I needed to try on. It was simply love at first sight. With that finished, I could check one item off the list and move on to other important things, like shoes! Thankfully my bridesmaids were able to join me on a shopping adventure to Metropolis Mall in Plainfield, Ind., and I&apos;m pretty sure we tried on everything DSW had to offer. We decided we wanted our wedding to take place at my future in-laws farm, and I’ve had so much fun visiting local specialty stores and second-hand shops looking for personal touches to dress up the occasion. My favorite find so far was a bag full of beautiful hand-stitched quilt squares that I found at Gilley’s Antique Mall in Plainfield, which we’re planning to use on the tables at the reception. Then again, the earrings from Katie&apos;s on the Square in Danville, Ind., and vintage pins that my bridesmaids will wear were an exciting find also. Check, check and check! We chose to have an evening wedding so we can skip dinner and focus on two of our favorite things: dessert and dancing. My family owns the Bread Basket Café & Bakery in Danville, so it was an easy decision for me where those desserts would come from; now the only problem is which to choose. Oh well, we’ll just cross that off the list later. There are so many little decisions to make, and with just a couple months left until the big day it can feel a bit overwhelming at times. But luckily I have discovered resources that are available to me as a bride that most Hendricks County residents may not even realize exist. Working with the Hendricks County Convention and Visitors Bureau has been wonderful. They are so helpful and have given me great ideas about lodging and entertaining my out-of-town guests, as well as their bridal guide filled with local florists, photographers, and caterers. So when it does get overwhelming, I think of this pearl of wisdom Jason’s mom told us: "No matter what happens, at the end of the day we’ll be married, and that’s what it’s all about." JinAyla and her family run the Bread Basket Cafe & Bakery in Danville, Indiana. She has been involved with the business for seven years, and serves as a baker, server and bookkeeper, as well as wearing any other hats that the day requires.